If you are out of warranty on you Alma laser system or Alma handpiece, The Laser Warehouse can save you money on expensive Alma Laser repair costs. We only use OEM parts and our certified technicians have repair hundreds of Alma IPL and diode handpieces. Because we have parts in stock, we can offer quick turnaround times. Our certified technicians can also reset the shot count on your Alma handpiece, extending the useful life of your equipment. Contact us today for free trouble shooting for your Alma handpiece – 954-254-4612. It helps to have the error code you are receiving for your equipment to provide faster troubleshooting and especially for base unit repair issues. Most Alma Laser equipment repairs can be made within 2 – 3 days. 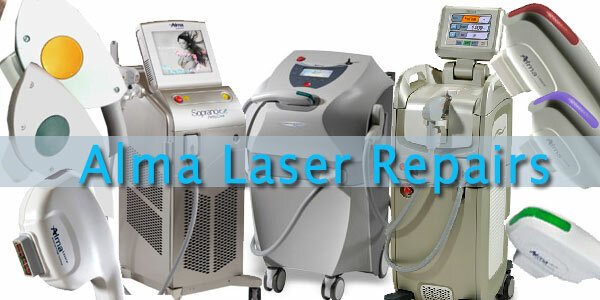 If you need Alma handpiece repair or reburbishment services, The Laser Warehouse stocks OEM parts for Alma handpieces. We can usually turn these repairs around in 24 – 48 hours. Alma Laser Systems: Harmony, Harmony XL, Harmony Elite, Soprano and Soprano Ice laser systems. IPL Handpieces: 515 Cooled, 540 Cooled, 570 Cooled, 570 Non-Cooled, 650 Cooled, 650 Non-Cooled, SHR and Speed. Quotes will be provided if crystal is damaged. Turnaround Times: Expected turnaround times are 2 – 3 days. We stock a huge supply of replacement parts to ensure we meet these timelines. Get a FREE ESTIMATE Today, Call (954) 254-4612. We can repair Alma laser handpieces and base units. See the list below for complete details. Don’t hesitate to contact us – all troubleshooting is free of charge.